SOA Candy Cane Lane Collection is Live! Today Catherine Pooler's Candy Cane Lane Collection is released! Oh, the stag from Hip Holiday, how festive is he in his red glitter antlers?! And his red glitter nose, pretending to be Rudolph or something! He comes with tiny stamps to define the inside of his ears. 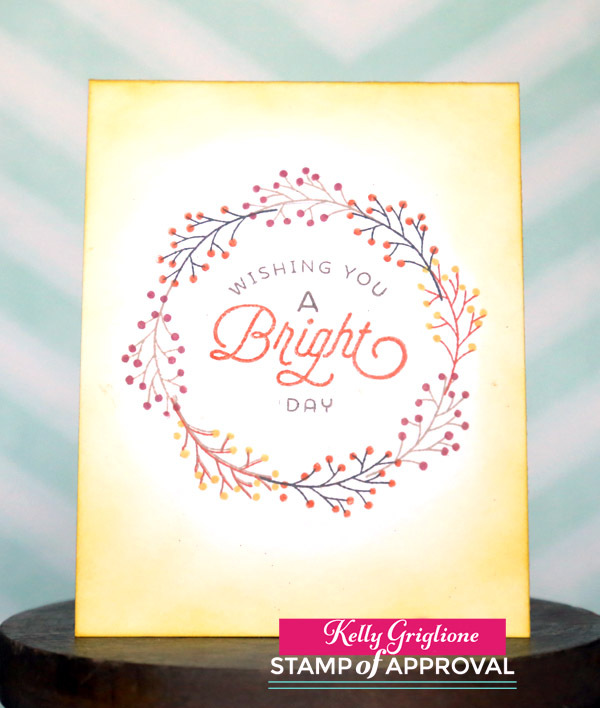 The sentiment from Merry and Bright Boughs is embossed with gold first, and then layered with white embossing. The Merry Labels die makes such a good panel for the front of a card, great for layering. And the embossed edge detail adds so much. This set, along with everything else in the collection, is available today at Catherine Pooler's Stamp of Approval! Hi Folks! I've got a sympathy card to share with you on the Winnie & Walter blog today if you would like to go check it out. Happy (almost) first day of Fall! Thanks for looking! Hi Folks! 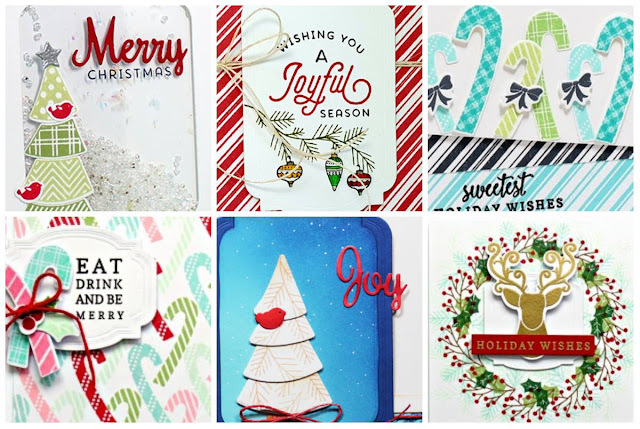 I am so thrilled to be participating in Catherinep Pooler's Stamp Of Approval blog hop, featuring the brand new Candy Cane Lane Collection! In case you haven't heard of Stamp of Approval, each collection contains new, exclusive stamps and dies that are meant to coordinate with each other. Most of these products won’t be available individually until much later in 2016 or early 2017. If you want to be one of the first people notified when they go on sale, simply subscribe to the wait list. The collections sell out quickly! 1. Make a wreath. For this card I traced a circle with pencil and then stamped the holly sprig around the circle. You might think coloring all the leaves is labor-intensive, but it's actually not bad. For each leaf I swiped a light green marker straight down the middle, and then made a smaller swipe with a darker green marker. The holly berries have the highlights in them already (love) and then let's talk about that sentiment ... the curve of "wishing you" could not be any more perfect to fit inside a wreath! Since they are all separate pieces it's easy to pop the "joyful" in a coordinating color. Finally, the inside is stamped with the Peppermint Stick Background stamp. The dense, red stripes are a good contrast with the clean, one-layer, white front. 2. 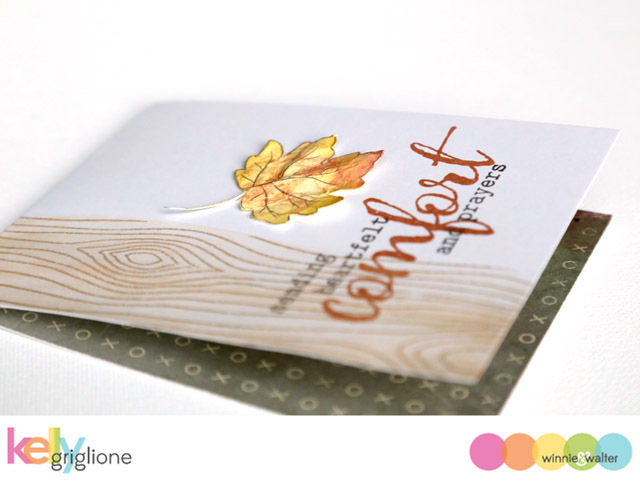 Make a FALL card. Any time I can get more than one occasion out of a Christmas set, I'm excited. So you may imagine how happy I was to figure out that this set makes a pretty charming Fall wreath. Same penciled circle as the last card, and then stamp the branch and berries. Having the branch and berry images separate makes for quick multi-colored images. The sentiment is made non-Christmasy by using brown and orange, and by covering up the "holi" in "holiDAY". The edges of the card are blended with yellow ink. You would never guess this card came from a Christmas set! 3. 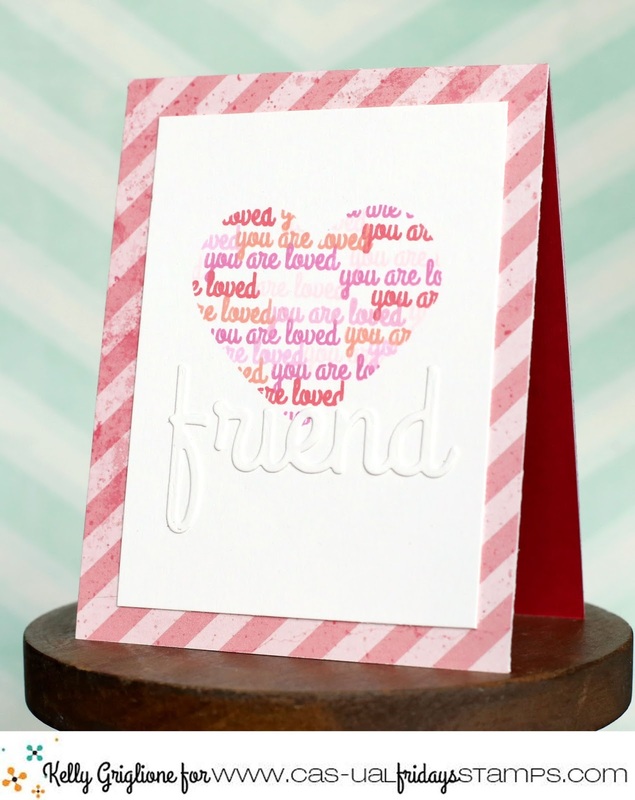 Create a sentiment inside your card. I'm always looking for a good sentiment for the inside of my Christmas cards, and this may just be it. Even though there's a lot to it visually (the curve at the top, the second color in "merry", the script vs. print font, the holly image) it wouldn't be hard to mass produce. You would have all the black ink elements ("wishing you a", "christmas" and the holly sprigs) laid out on one stamping block, and then all the red elements ("merry" and the berries) on a second stamping block. Then it's just a matter of swiping the markers to color the holly. 4. Make a Christmas tree. Like the wreaths, I lightly drew a tree trunk and branches in pencil, and then went about stamping the pine boughs in different colors of green ink along the lines to make my own tree. With this method, you can make any size tree you want ... short or tall, fat or skinny. So versatile! Also, this set comes with two different pine bough stamps that curve in opposite directions. This helps make the tree look like it wasn't made with the same stamp repeated over and over. The star on top is from the Hip Holiday set. 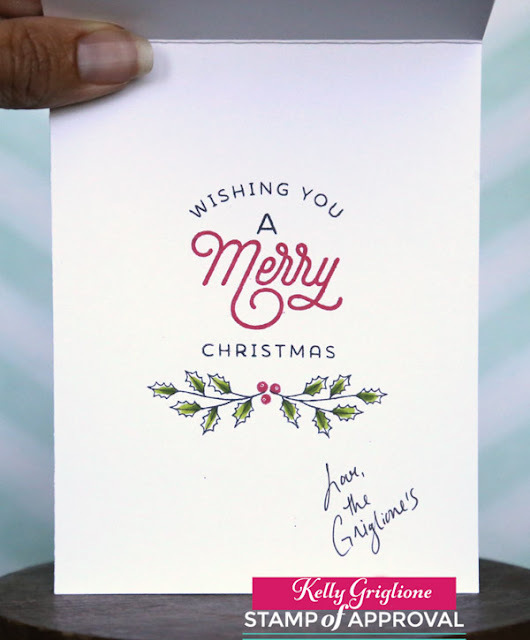 The "Merry" die is from the Merry Labels dies, and to make it curved I just bent the paper in between the letters slightly. This is a two-fer example ... I was practicing on another card and thought I might as well finish it off. This tree has sequins to dress it up, but you could add ornaments, presents, peppermints, all of which are stamps in other sets in this collection. 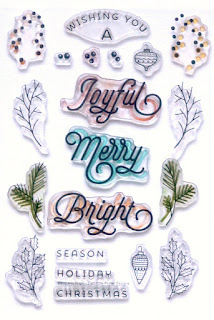 The sentiment is layered embossing on a label die from Merry Labels. 5. Make a Charlie Brown tree. Hahaha, these trees always crack me up, and to be honest, I've always wanted a stamp like this. So easy to make your own Charlie Brown tree now. 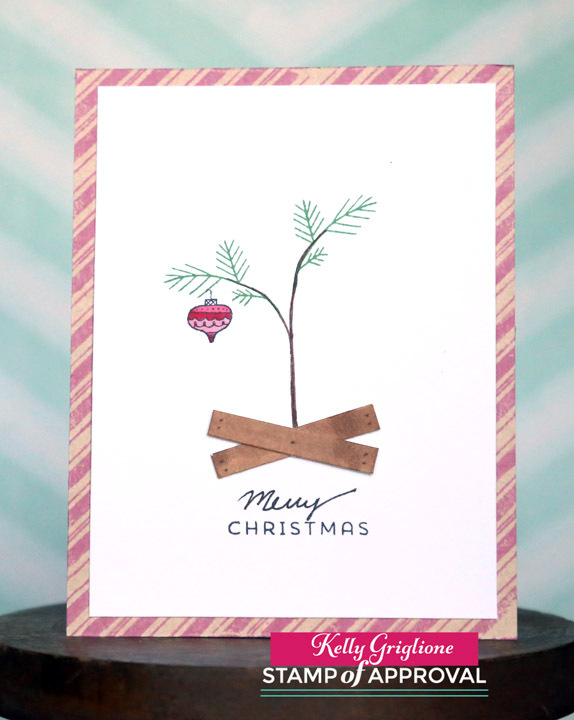 Just stamp the evergreen boughs twice, and then use a brown felt-tip marker to trace over the branches and make the trunk. For the base of the tree I cut two rectangles, colored them brown, and then made nail hole marks with a black pen. The sentiment uses the "christmas" stamp from this set, and then I just wrote "merry" in cursive above it with a felt-tip marker. 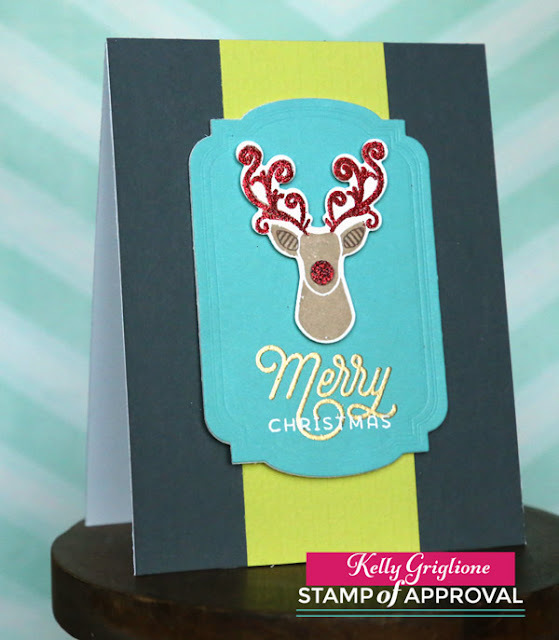 Finally, the whole panel is layered on top of a kraft card base stamped with the Peppermint Stick background stamp. So now you see how much I enjoyed working with this stamp set, AND, there are two additional stamp sets included with this collection that I didn't even tap into yet. Not to mention the die sets! Lots of goodies here! Your next stop on the blog hop is the very talented Laurel Beard! This is the first day of the hop, but be sure to check out the hops on the next two days with a whole new set of designers and projects. Not only are you in for lots of inspiration, but on each of the three days of the hop, Catherine will be giving away an entire box of this seriously fun collection! You just need to leave a comment to be entered to win. The sales links go out to StampNation members and the wait list on September 21st, and then the general public on September 22nd. Hi Folks! Time to check yourself! It's hard to believe this hop has been going on for one year and one month already! I hope you've gotten into the habit of checking yourselves on the 17th. In fact, you might as well do your checking WHILE you are hopping, right? That way it doesn't take any additional time out of your schedule. Nice and easy : ) For more information and background on this hop, please check out Michele's inspiring story. This card uses the Heart Board Fri-Die to make a heart stencil. Then I stamped the "you are loved" sentiment in many different purple/red/melon/pink colors from Hope Ribbon to fill the stencil. I'm pleased that the words "you are loved" have the same meaning as the heart shape. I wanted the rest of the sentiment (from Friend Fri-Die) to be tone-on-tone since it's much larger and I wanted the focus to be more on the "you are loved" portion of the sentiment. I hope you're enjoying the hop so far! Should you be interested in purchasing anything from the Calling All Sistahs line, 50% of the profits are donated to National Breast Cancer Foundation. You can also use my code KELLY2016 to get a 15% discount on your purchase. 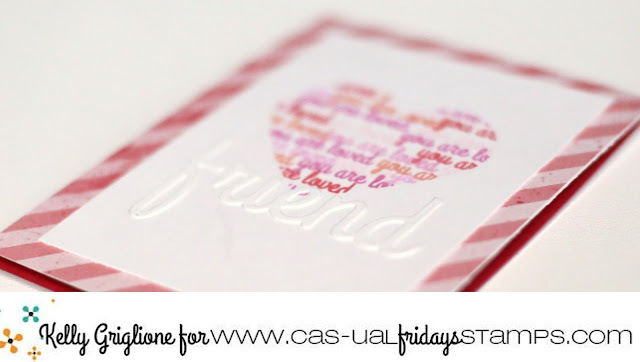 Check out all the details at CAS-ual Fridays, along with information on prizes. Hi Folks! 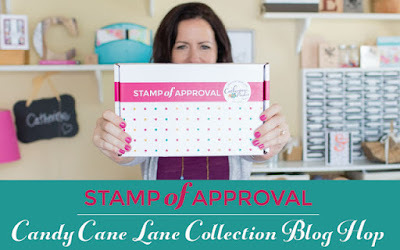 I've been anxious to share a new Stamp of Approval collection from the amazing Catherine Pooler with you all! Here are some sneak peeks from several designers who are participating in the release of this latest collection called Candy Cane Lane. You guessed it, lots and lots of holiday-themed stamps and dies! Be sure to check out Catherine's preview tomorrow on her blog, and then join us for three days of blog hops starting this Sunday the 18th!